I’ve never really been a chip person. Some people are always scooping up a bag of chips at the grocery store. Maybe they are the worst hydrogenated oil chips out there or maybe some fancy Whole Foods brand of ‘healthier’ chip alternatives, but that was never me. In truth, my sweet tooth will win out over salty anything on most days. I say most days though because there is a certain time of month when I can get a terrible hankering for salt and back in the day I would go straight for salt and vinegar chips. It was only during that time of the month when those mad cravings for salt would hit me and usually, if I gave in and reached for a greasy bag of S&V chips, I would end up feeling way more bloated than before and probably even find myself with a massive headache. Craving salt around your menstrual cycle is not unusual but giving in to the cravings with ionized table salt is NOT the ideal solution. So for years I flip-flopped. I would either resist these cravings by sheer force of willpower, or give in, devour a bag of salty tatter chips, and feel gross. Then along came kale chips. The introduction of the dehydrated kale chip was a game changer. At this initial point, there were only a few flavors on the market such as cheesy (made with nutritional yeast) or spicy. But my first thought was, where’s the salt and vinegar flavor? 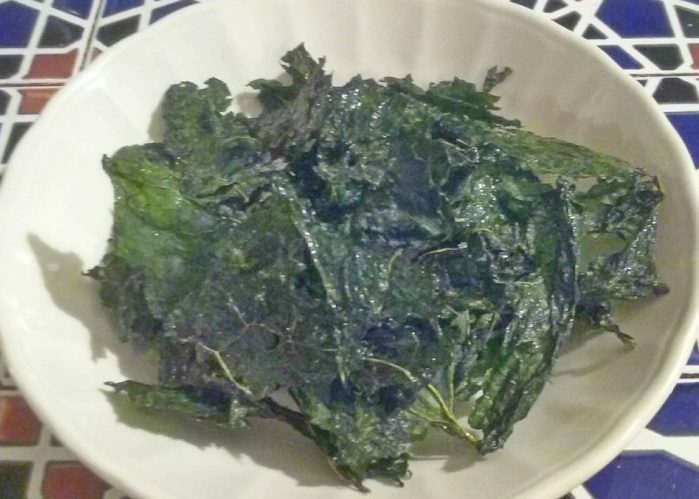 Now this was way before i had a dehydrator, so I was working with your run of the mill oven, (which by the way works just fine) but I certainly wasn’t going to wait for those salty vinegary kale chips to show up for sale at my local healthfood store. Nope, I was determined to make my own. Yes, it is salty. And yes, you don’t want a lot of refined salt in your diet but also, yes, we have a serious mineral deficiency and people need minerals and particularly high quality sodium in their diet. Just not a ton. My answer? Himalayan pink salt or celtic sea salt (heck even Hawaiian lava salt if you can swing it). Why not? Good sources of sodium like those are great for the adrenals and give your body the minerals it needs. Just be sure to drink enough water to help those minerals move their way through the body. And then there’s vinegar. Not that gluten-y malt vinegar, no way Jose! We’re working with only the best organic apple cider vinegar with the mother in there. Wash kale and remove stems, tearing into bite sized pieces. Then place kale in a large size bowl. In a small bowl mix the oil, vinegar, and salt. Drizzle mixture over the kale. Massage the dressing into the kale till well coated and the kale begins to wilt a little. Spread kale on a few dehydrator trays and dehydrate at 115 degrees for 4-6 hours or until the chips are super crispy. If you don’t have a dehydrator, spread kale out on to a parchment-lined baking sheet. Then turn the oven down to the lowest temperature possible and bake for approximately 15-20 minutes, with the oven door slightly ajar. Check to see if the chips are crunchy. If not continue to check every 5 minutes until you get a crunchy texture. Last step is to hide the chips from yourself if you don’t want to devour them all in a single sitting.